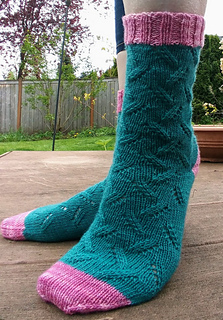 These socks are beautiful and fun to knit. 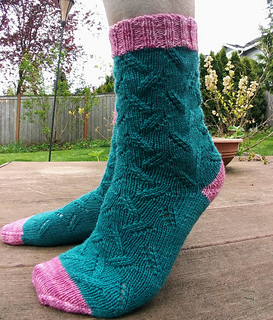 The lace detail is ideal for all knitters, whether this is your first pair of socks with lace or your 100th. You’ll find it engaging and the pattern is easily memorized. I’ve included instructions for both cuff down and toe up variations depending on your preference. It features a short-row heel but could be easily adapted to your preferred heel method. Sample was done with contrasting color for toes, heels and cuffs but isn’t necessary and would look lovely in all one color.